Normally, I wouldn’t be pumping up a book like this, dedicating an entire post to it, but I’m just blown away by the quality of the offer and want to share it with you! I talk a lot about how we make choices, set priorities, and doing the work that matters to you, and here is a resource which can help you in the mission! 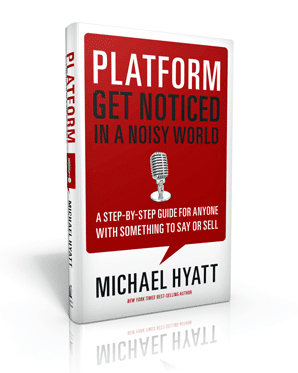 Michael Hyatt, author, speaker, podcaster, and blogger, has released his new book this week, titled Platform: Get Noticed in a Noisy World (affiliate link). I just bought the book myself, and am very excited to dive in. The premise is all of us need a Platform to be noticed, regardless of our calling. This is especially true for creative people, who regardless of their talent, need to have a way to get the word out on their art! Or, go directly to Michael Hyatt’s site and read about why he wrote Platform, and get the lowdown on 7 Free Resources worth $375.98! This entry was posted in Book Reviews and tagged bonus, book, free, kindle, michael hyatt, platform by mattragland. Bookmark the permalink.